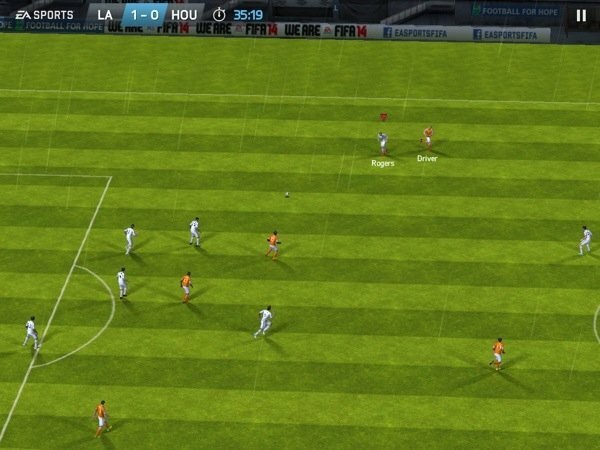 Electronic Arts have been teasing the next FIFA title for quite some time, especially bragging their new control system. 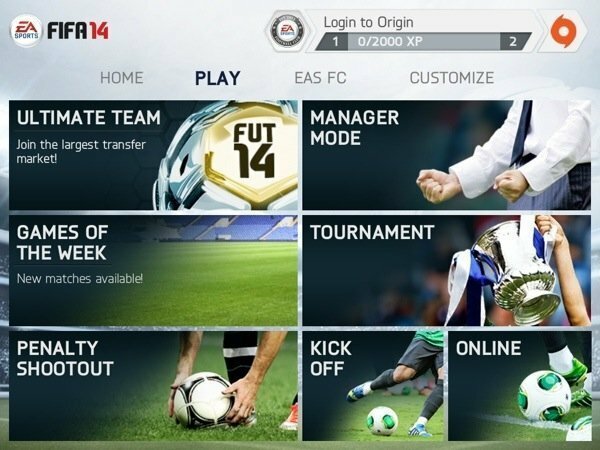 Putting an end to our waits, FIFA 14 kicked itself into the App Store last week and got featured by the Editors, too. 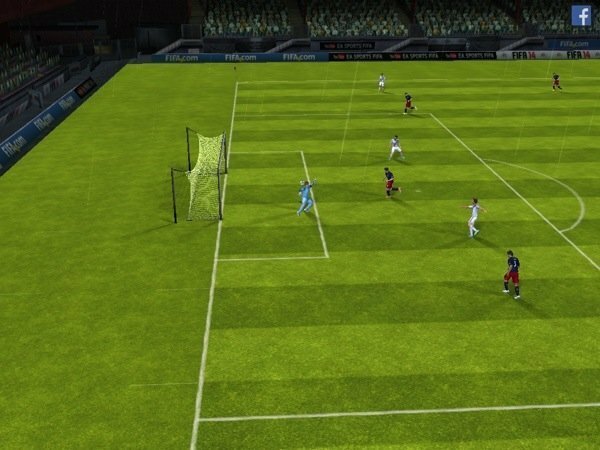 Not often do we see a FIFA game available free of cost but as you might’ve already guessed, the gameplay is a lot restricted here. In this review, I will be dealing more with the Pro version or the completely Unlocked version of the game. Also please note that I’m playing the US version (the world-wide release is a bit different). Many quality free games like Real Racing 3 and Infinity Blade sports a freemium model where you can play for nothing as long as you can and buy stuff only when you’re stuck. 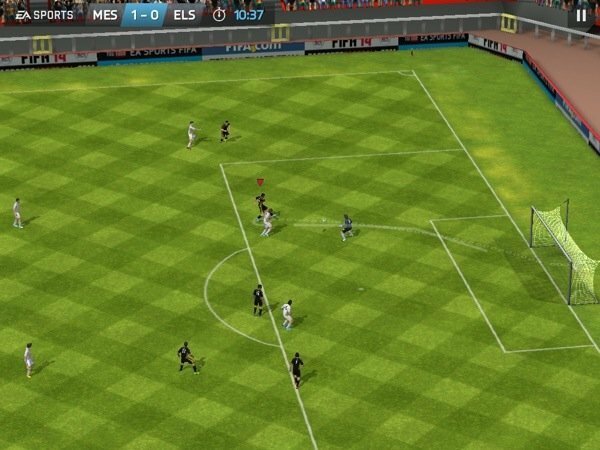 But if you’re thinking of a similar setup in FIFA 14, unfortunately you’re mistaken! 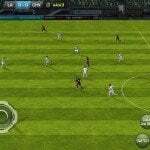 After downloading the hefty 1.5GB game, you realize that you’ve to spend the rest of your life with just a Tutorial, Penalty shoot out and some online Multiplayer games. All the other core game modes are locked secure, leaving only the boring stuff for you. 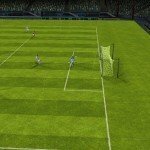 So if you’re looking for the original FIFA experience, keep 5 bucks ready. Once you tap that buy button, the Tournament mode, Quick play and Weekly match series are flung open to your swiping skills. 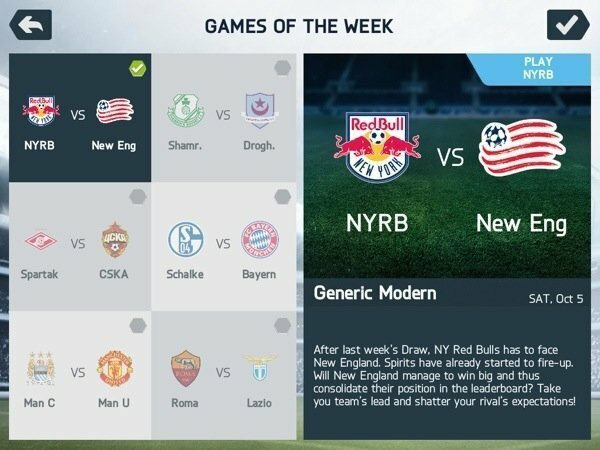 Kick off mode lets you ‘pick and play’ anytime with quick matches and you know what the Tournament mode does. 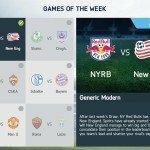 Play in ‘Games of the week‘ section to win trophies at EA Sports cup, MLS cup, the Russian League and other series. 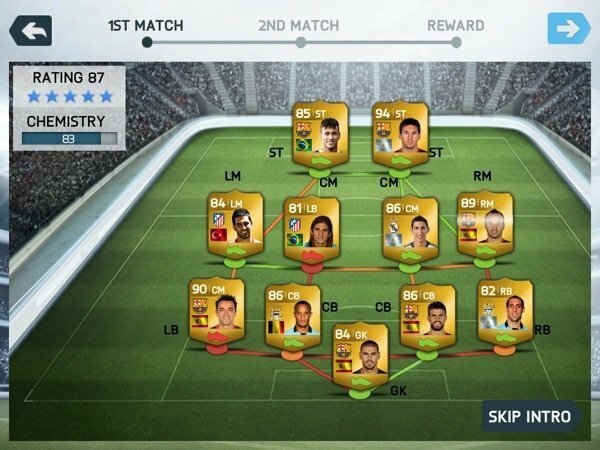 Start a career as a club owner in the Manager mode or trade players in the ‘Ultimate team‘ tab. 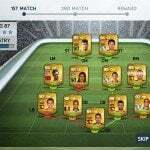 In short, everything you expect to find in the console version of FIFA 14 is available on your iPhone and iPad also. Another major drawback of the free version, ie. 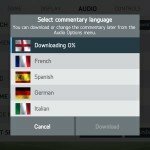 the lack of live Commentary is also solved by the purchase and you can download them in any of the 5 available languages. As far as gameplay is concerned, it is pretty much unchanged from the previous titles. The same old dribble, pass & shoot for attack and sprint, slide & tackle for defense. 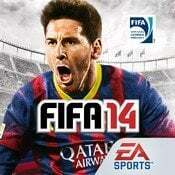 No one needs an introduction to Football rules now, but I can say that addiction holds strong in FIFA 14. Tricky maneuvers, cheeky shots and the room to innovate makes you want more and more. 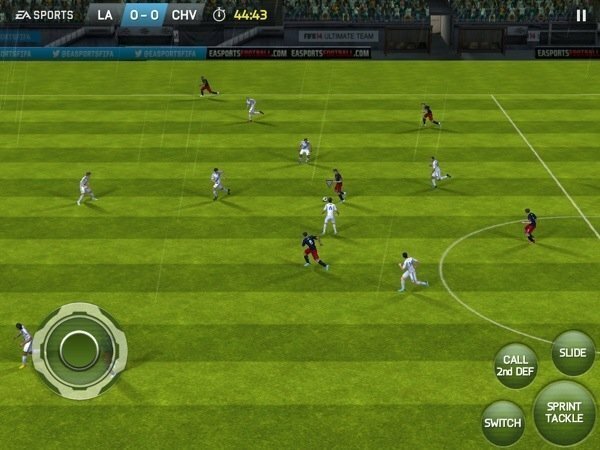 And with tons of gameplay options and matches, you’re sure to have hours of footy fun. 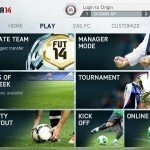 The Multiplayer mode however, doesn’t seem to work for me as I cannot login to Origin. It always returns an error and hopefully will be fixed in their next update. But this game is more about the ‘new way to play it’, than anything else. So lets jump into that. 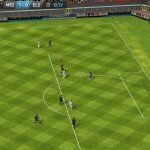 EA has brought a new ‘slide and tap‘ or gesture based controls, replacing the conventional ‘stick and buttons‘. For those who are not ready for the change, the classic controls are also available in the settings, but I wouldn’t do that. Though the new controls seem odd at first, you’ll quickly fall into the slot. Tapping to pass, sliding to shoot and dragging to run not only turns the game simpler but also makes alot sense. 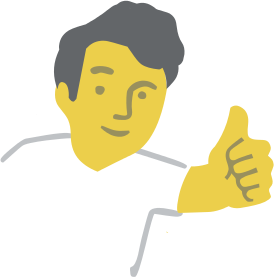 With these gestures, you can control more than one player with your pinky or with the other hand. This was impossible with the old system and is my favorite, as it makes the game super-exciting. After about half an hour into the game, you just cannot shift back. This is of course the experience on my iPad’s larger screen but with my talks with iPhone users, they had mixed feelings about the new setup. As you can see, the gameplay nor the graphics has changed much but, the addition of a revolutionary control system, is EA’s major selling point and quite a good one too. New matches and downloadable content are regularly added which keeps things fresh. iCloud sync is also worth mentioning which not only helps playing across multiple devices, but also to play multiple tournaments at the same time. 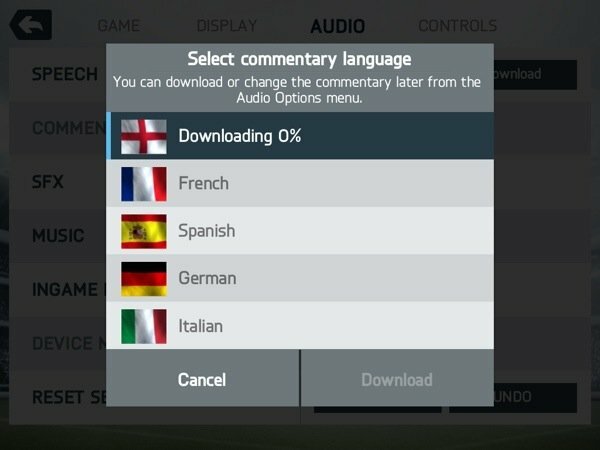 My final word would be to grab the premium pack if you’re on an iPad or if you donot own any previous FIFA titles. But if you have an iPhone, get the free version and check out the new controls. If you’re comfortable, unlock the rest or else tap & hold, wiggle and delete! Try both controls for atleast half an hour each, before you stick to one. You can select the classic controls and still use some of the new touch controls – Best of both worlds! While controlling the ball, you can swipe on other players to send them forward or to lose their tags. 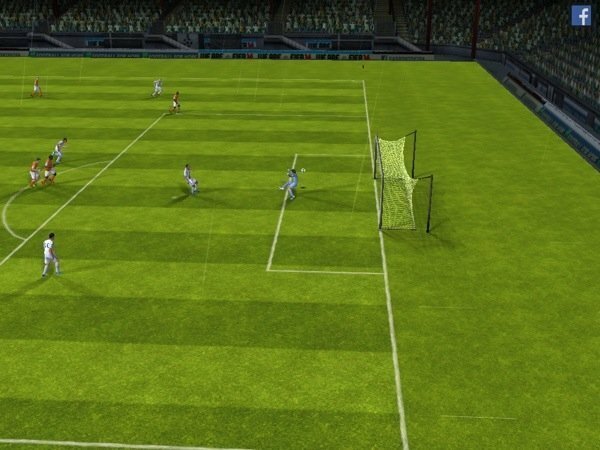 To do a fake move near the goalkeeper, just swipe right or left. 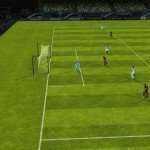 Double tap a team mate to chip the ball over another player; Double tap the post, to chip over the goalie! Who Is It For:Football fans, of course. 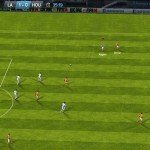 What I Don't Like:Multiplayer bug.